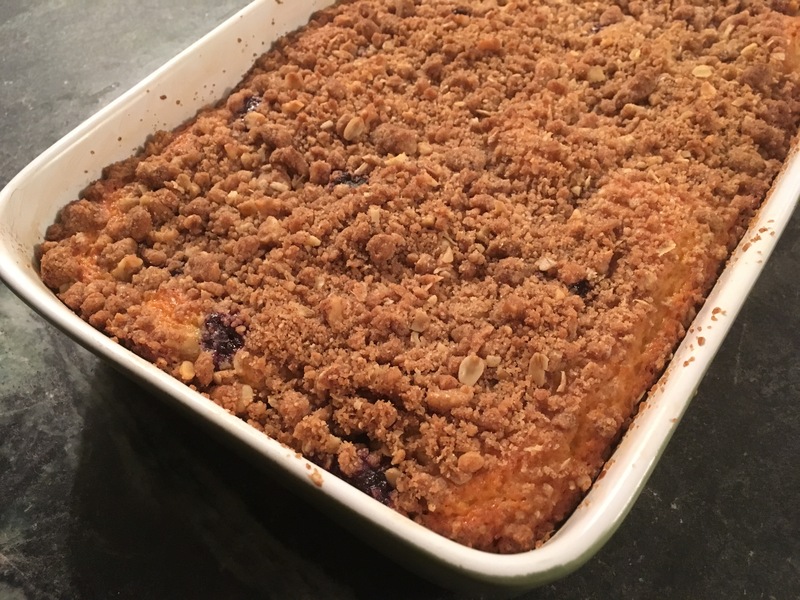 This week Wine & Dine Wednesday Mister Sive is at the helm with his always popular blueberry coffee cake recipe. He made this the past week and I have been savoring every little morsel. We enjoy this for a breakfast treat with coffee, but also in the eve as dessert. Cake is far too wonderful an invention to limit it to dinner! Breakfast, too, is followed by dessert. The following is a fairly simple recipe, good with a range of berries. This version highlights some fab blueberries that seemed just the bright sweet thing for a winter treat this week. The yoghurt is a great mix with the tang of the berries, the sweet dough, and the crunchy hearty cinnamony crumble. Prepare the topping by adding all the ingredients to bowl, and mushing/massaging together with your finger tip until there’s a mix of larger and smaller crumbles. Set aside. Preheat the oven to 350. Combine the flour, sugar, and baking powder with a fork. Beat the yoghurt and eggs and until mixed. Add the flour mix to the wet mix and beat until just smooth. Don’t overbeat. Spoon the dough into a buttered 9×9 pan. 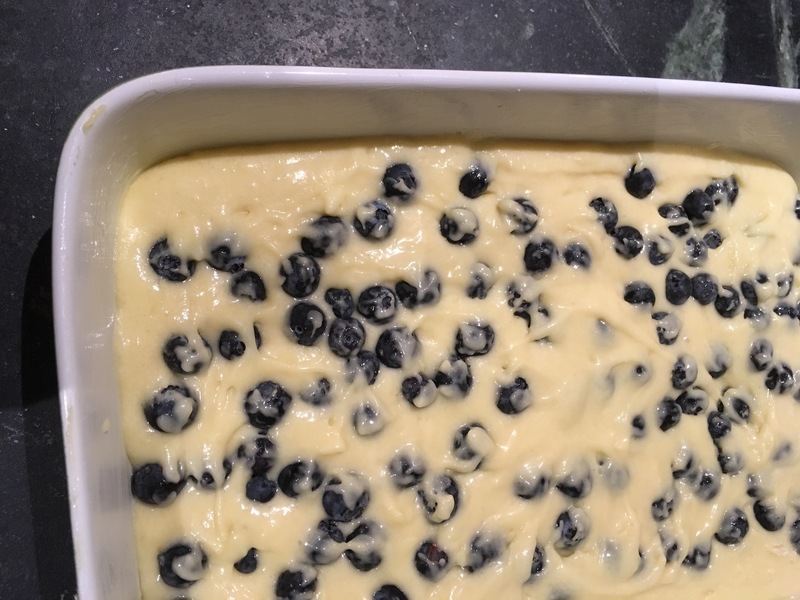 Spread the blueberries evenly on top of the dough, and lightly push in, keeping the blueberries toward the top of the batter. (Don’t mix the blueberries in the batter, as that will break the skins.) Lightly spread the crumble over the top. Bake for 35 or so minutes, until a toothpick comes out clean. Serve with piping hot coffee and remind yourself that since it’s got oatmeal and walnuts, it’s really healthy. 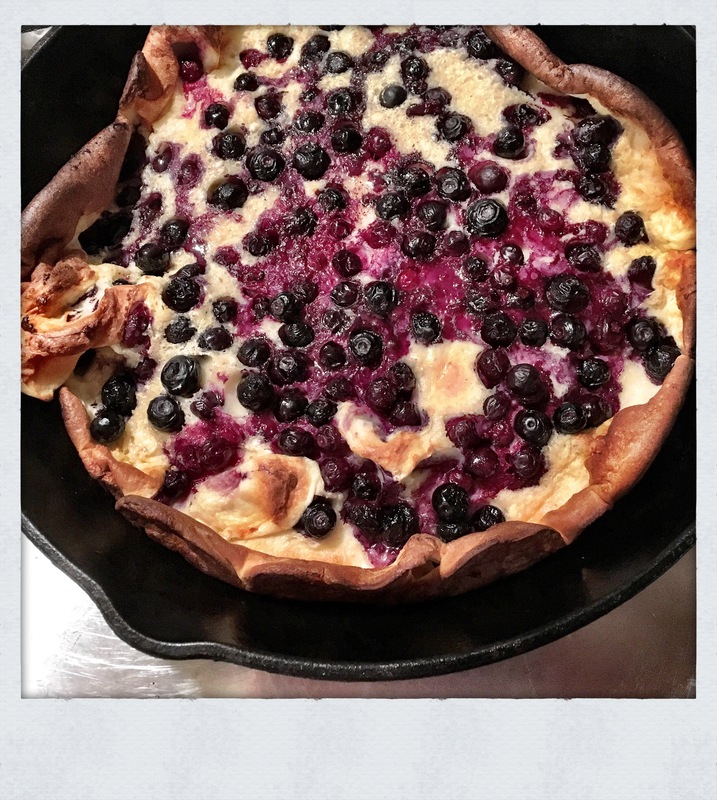 This has become one of my new favorite desserts, sort of a cross between a pancake and a soufflé, to make this Summer as the blueberries have been exceptional on both coasts this season. But I plan on making this year round. I first saw a recipe for this in a magazine when we were at Hawthorne and gave it a try. I have since seen mention of it as a breakfast option, which I think would be yummy too, but I really love serving it as a dessert. A black cast iron pan/skillet from 8 to 12 inches is best, but I have also make one in a non-stick pan and it worked swell. Turn on the oven to heat up to a hot 425 degrees while you mix up this batter. In a good sized bowl add a half of a cup of flour, half of a cup of whole milk, 2 eggs, 2 tablespoons of sugar, and an 1/8 of a teaspoon of both salt and ground nutmeg. Mix all together. Don’t worry, fine if a tad lumpy. Set aside. Then add 3 tablespoons of unsalted butter to the pan/skillet which is on the stovetop on medium high heat. Let the butter melt being sure it is covering the entire interior surface of the bottom of the skillet. Then add the mixture to that. Working quickly, scatter a half to a cup of fresh blueberries to the mixture. It is now ready to go into the now quite hot oven for 15 to 20 minutes. Check at 15 and if it not inflated and brown edged, cook a bit longer. It is the prettiest, puffiest darn thing right when it comes out of the oven (which makes it soufflé like) but will deflated quite quickly (which makes it pancake like) while still so yummy looking. Take a half cut lemon and squeeze over the entire thing. Cut and serve with a spoonful of maple syrup over each piece and to guild the lily, add a sprinkling of powdered sugar right when ready to serve. I promise you will have happy guests. Enjoy! I just could not pass it up. We are big fans of the blueberry. My favorite organic farmer at the Market had these heaping bags yesterday. One came out to the island with us last eve. 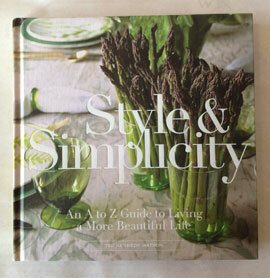 My mind is swirling with the possibilities–crostata, crisp, over oatmeal, muffins. 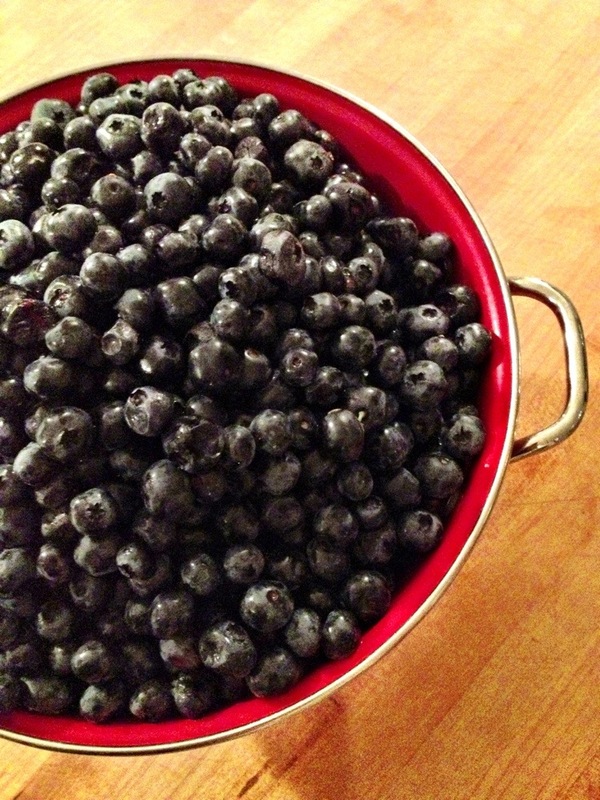 What are some of your favorite ways to use blueberries?